World Wetlands Day was created to highlight the destruction, draining and pollution of wetlands, of all forms, across the planet and to highlight their importance, not just for wildlife, but also for our own very existence. To celebrate this fact, and as we haven't been out to use our bins for a while, and the weather was half decent, if a little cold, Elis and I decided to go and have a look at some of the local wetlands in our area. Wetland habitats are still disappearing at an alarming rate causing problems for wildlife everywhere. The three wetlands that we chose are all run by The Parks Trust in Milton Keynes. The first we visited is a small nature reserve at Stony Stratford. All the open water was frozen so there was little about, we did catch a glimpse of a Water Rail, but there were none of the hoped for Northern Lapwings about. They have bred at this site and in 2014 there were 6 nests with 5 young reported, according to Martin Kincaid (Biodiversity Officer of the Trust). Also in 2014 there was a pair of Eurasian Oystercatchers which had 3 young and 2 pairs of Little Ringed Plovers but unfortunately none of the young are believed to have survived. There were no Common Redshank reported breeding last year here although in the 1980s they were quite common. Martin hopes that work being carried out will bring this species back to Stony Stratford. 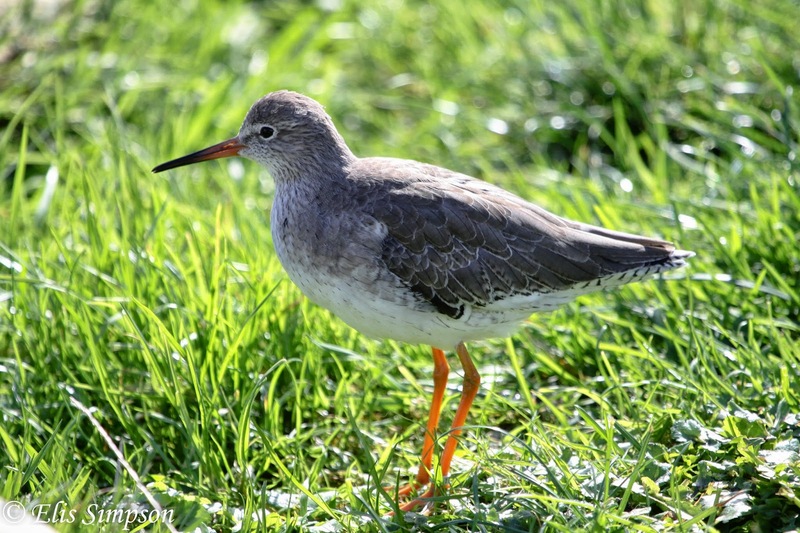 Common Redshank; will they return to breed? Having failed to find any waders at Stony Stratford we moved on to the wader mecca (for Milton Keynes) that is Manor Farm. Water levels were low and plenty of mud available, but here again we drew a blank although local birder Ashley Beolens reported 7 Common Snipe flying in after we had left! This site is planned to be developed by The Parks Trust, to reconstruct a very ancient habitat that is all but extinct in the region now; flood plain forest. During the work that has been carried out, the area has become, inadvertently, a must visit site in the area for wader watchers with a Pectoral Sandpiper and Red-necked Phalarope being the star rarities so far both of which were seen here in 2014. You can see why this site attracts waders like it does. Among the many other wader species that have been seen here recently are; Eurasian Oystercatcher, Northern Lapwing, Golden Plover, Grey Plover, Common Ringed Plover, Little Ringed Plover, Bar-tailed Godwit, Black-tailed Godwit, Common Greenshank, Common Redshank, Spotted Redshank, Wood Sandpiper, Green Sandpiper, Common Sandpiper, Dunlin, Little Stint, Sanderling, Ruddy Turnstone and Ruff, of which Eurasian Oystercatcher, Northern Lapwing, Little Ringed Plover and Common Redshank are thought to have bred successfully. Plans for this place have been modified a little as a result of this amazing number of wader species using the site on migration and for breeding so that their needs can also be taken into account. Spotted Redshank, always a welcome sight. Not being ones to give up we then went to the Hanson Education and Study Centre (HESC) at Great Linford. The water was unfrozen here and there were many ducks about, a hundred or so Greylag Geese flew in and a whistling flock of Eurasian Wigeon came whiffling down from the sky. We were about to give up on finding any waders, there were no lapwings here either, when I caught sight of a snipe in the reeds. Looking more closely the colour of the broad stripe down its back that I could see seemed to be a creamy colour. I had suspicions, that were confirmed when the bird started to bob up and down, that we had come cross a Jack Snipe. Typically the bird stayed mostly hidden but it did walk out into full view briefly. 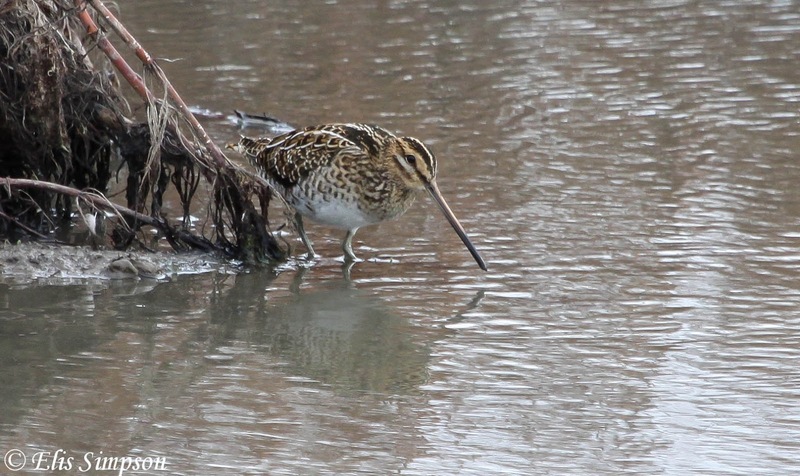 The snipe was in the reeds on the bund. It is hoped that this bund will be returned to its former glory as a breeding habitat for waders in the future by The Parks Trust which has recently taken over management of the site. The bund at HESC. The Jack Snipe was in the reeds to the right of the artificial kingfisher bank. It seems strange. When you have a day when only one individual of one species of wader is seen that it should be the elusive Jack Snipe. Still, we're not complaining! Jack Snipe, not easy to see even when you know it's there!